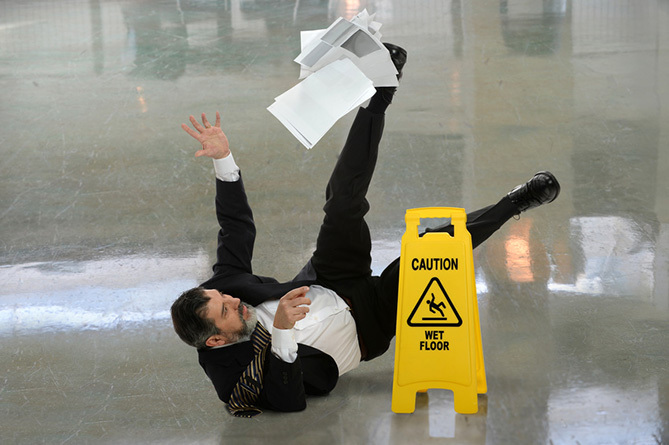 If you have suffered an injury caused by Slips and Trips at work, you could be entitled to compensation. Slips and Trips are one of the most common causes of injury at work, and can cause minor injuries as well as more severe injuries, including broken bones. Your employer has a duty to ensure you are safe whilst at work and must take certain measures to implement this. One of the most common causes for Slips and Trips at work is obstructed walkways. Whether you work on a site outside or work inside an office, the route needed to navigate the workplace must be kept hazard-free and clear from obstructions. This includes spillages, loose wires, objects blocking routes, etc. Your employer is also responsible for ensuring the surface of the walkway or road is sufficient and doesn’t present any risk of injury. Other factors your employer must consider include footwear. If necessary, you must be provided with suitable footwear that is safe and practical, particularly if you work in the building industry where steel toe capped boots are compulsory. Not being provided with suitable footwear can increase the chance of Slips and Trips at work and therefore increase the risk of injury. At Centenary Solicitors we specialise in Personal Injury Claims, commonly arising from Slips and Trips at work. Whether the injuries you have sustained are minor or very severe our team is always happy to assist. If you’ve been injured as a result of a Slip or Trip at work, contact us today. Our Solicitors will work hard to ensure your claim is processed as efficiently as possible and you receive the maximum amount of compensation for your injuries and losses. You can complete the simple claim form to the right, select ‘contact us’ above, or speak to a member of our team by calling 0800 1123 256.